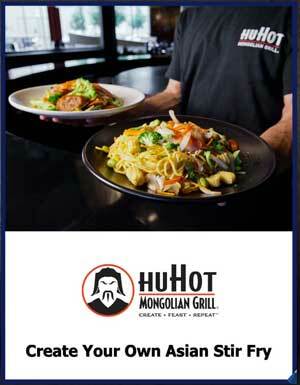 HuHot Mongolian Grills mix up unique concept with smart growth. If you imagine a Mongolian grill restaurant, you might not instantly imagine it in Missoula, Mont. But that’s OK with Molly Vap O’Shea. In fact, for practical purposes, her role as VP of franchise development for the burgeoning HuHot Mongolian Grills chain is to see that the brand expands far and wide from its “Big Sky” roots. Though it now boasts 54 locations across 16 states, the idea took hold in Montana’s second-most populous city in 1999, shortly after O’Shea’s parents – Dan and Linda Vap – returned from a trip to nearby Portland, Ore.
As luck would have it, her brother, Andrew Vap, was living in the Washington, D.C. area at the time and looking for an opportunity to move back out west. The parents went all-in and opened the first restaurant in Missoula, then allowed Andrew to take the lead in transforming the business to a franchised operation. 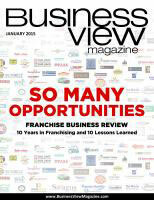 The first franchised location was opened nearly 1,200 miles away – in Omaha, Neb. – three years later, and Andrew now serves as the overall operation’s chief executive. Fifteen years after the initial meal was prepared, self-assurance remains a primary ingredient, too. The restaurant name, incidentally, comes from the word “Hohhot,” which is the capital city of Inner Mongolia. The original name in Missoula was “Mongo’s,” but it was changed when the business began franchising because the leadership sought something it believed with resonate better nationally. All but eight of the 54 restaurant locations are now franchises, and O’Shea said the corporate apparatus maintains an ownership stake in the other eight to both provide a laboratory for potential new approaches and concepts and to stay connected with the day-to-day issues faced by owners. The majority of testing is done in those eight stores, she said, though once a concept is deemed worthwhile it’s rolled out to the entire roster of locations on a uniform basis. Most of the restaurants are part of retail strip plaza set-ups and occupy roughly 5,000 to 6,000 square feet of space, and great care is taken to ensure all the branding elements are in place from one to another. And what appearance doesn’t do toward that end, she said, products will. 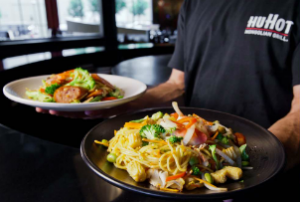 O’Shea said the HuHot leadership team looks less upon the relatively small number of active players in the Mongolian grill space as competition, and more at the plethora of restaurant choices available to consumers across the entire casual dining landscape. Differentiation in that environment, she said, is a combination of unique menu options and more hands-on control for guests. Another positive trend is the growth of adventure-based food programming on television. Prospective franchisees are required less to have restaurant experience in their past, and more to have simply proven the ability to operate a business and manage employees, regardless of the setting. The rationale, she said, is that good owners will hire good managers, who will then hire good cooks and employees to create the right type of in-house atmosphere. A similar “feel” approach is used when determining the right markets as well, though the company has identified California, Nevada, Idaho, New Mexico, Wyoming, Arizona, Texas, Oklahoma, Arkansas, Illinois, Kentucky, Ohio, Pennsylvania and Virginia as “key growth” territories. Franchises are also available across the Southeast and Northeast, while “limited development opportunities” exist in Washington, Montana, Utah, Colorado, North and South Dakota, Kansas, Minnesota, Wisconsin, Indiana and North and South Carolina. No opportunities now exist in Oregon, Nebraska, Iowa, Michigan and Maryland. 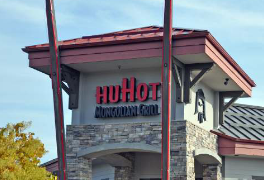 A new marketing approach and a new concept to work side by side with HuHot are on the agenda for 2015, she said, as is the growth of the franchise roster at an annual rate of six to 10 locations. “We don’t have giant targets,” O’Shea said. WHERE: Corporate headquarters in Missoula, Mont.